Update: Unfortunately, the Bog Bang slot is no longer offered. You can find similar themed games on this page. 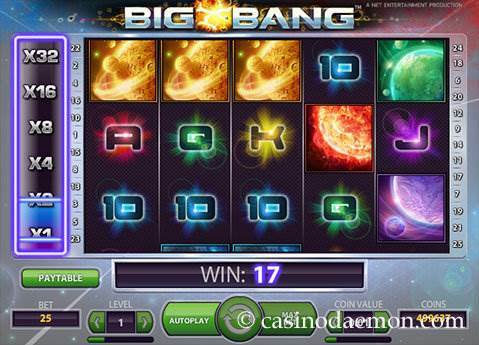 The slot game Big Bang from Netent is a space-themed game with an incredibly rewarding feature. The symbols are of planets, comets and stars, all in different colours. What makes the game so special is the increasing multipliers for consecutive wins. Unfortunately, the game does not have free spins or a bonus game, but the possible multiplier of up to x32 makes up for it. When playing the game you will find that wins occur often and you can win some decent amounts. It is not impossible or very rare to reach the x32 multiplier. The highest paying combination is 5 times the red sun symbol on a pay-line. Then you win 1.000 coins that are multiplied by your selected bet level. The maximum that can be won with a single bet is 268.032 coins. The theoretical return to player is at 96%, which is relativly average for a slot game. 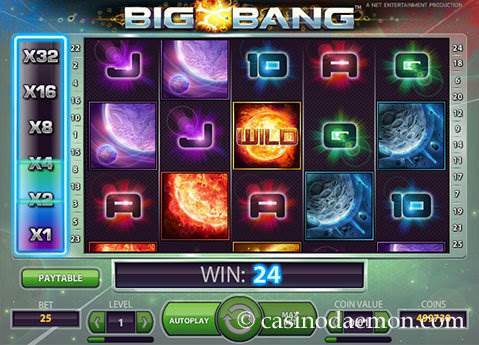 It is also possible to play Big Bang mobile on Andoid tablet computers and smart phones or iOS devices, as the slot is part of the Netent Touch mobile slot series. 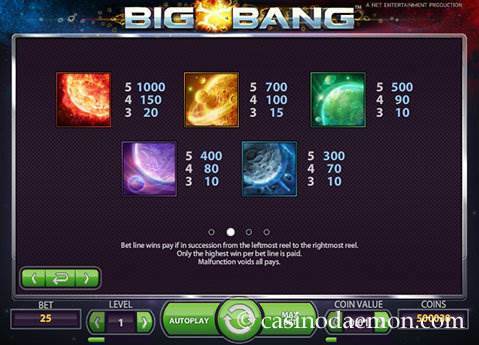 Big Bang has a wild symbol to substitute for all other symbols to complete winning combinations. When you have a winning combination the multiplier meter on the left-hand side will move up by one position. Every time you don't have a win the multiplier meter is reset again. If you are lucky and you have at least six winning spins in a row you will get a multiplier of x32 applied to all subsequent wins. 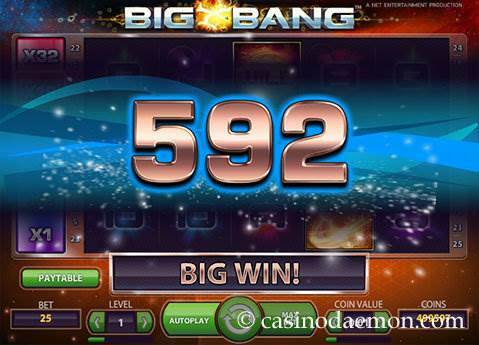 Big Bang from Netent has 5 reels and 25 pay-lines that cannot be selected individually. Coin values range from 0.01 up to 0.50 £/€/$, and you can play 4 coins per line. The minimum stake is 0.25 £/€/$, and the maximum is 50 £/€/$. The game also has automatic play options.